To Koma Gandy, the folks who mix her favorite tunes were always like the Wizard of Oz. "You go out to this party and the deejay is this mysterious entity behind a wall, where all this magic happened," says Gandy, 34, who lives in Brooklyn, N.Y. "I've always wanted to see how the magic was constructed." Thanks to the recession, Gandy and many others are finally getting a chance to connect with their inner-MC. After she lost her hedge fund job in December, Gandy, a Harvard undergrad who also has an MBA from Georgetown, made a list of the things she's always wanted to do, if a lifetime of work and achievement and climbing up the corporate ladder don't get in the way. Near the top of the list: learn to rock a party with a turntable. "I figured, now is better time than any to do this,' says Gandy. "It might be my last chance. And I don't want to be one of those people, at the end of life, who says, 'I wish I had gone for it." New York is not the only city enjoying a deejay boomlet. In San Francisco, the D4LIFE Academy's student registrations are up 40% over the last 12 months. Sasha Tosic, founder of DJ4LIFE, also says enrollment has risen in Los Angeles, Chicago and Las Vegas. Robb Smith, owner of Central Florida-based FAME training school, has seen a 20% jump in deejay certifications this year. Aspiring deejays are flooding the schools, and flooding the market. "It's a lot easier to find a deejay these days," says Mark Rankin, who trains deejays in Chicago. At these schools, students learn the technical aspects of the trade, as well as the basics of, say, running a wedding. One lesson from Rankin's classes  if you're going to announce a cake cutting, make sure the photographer is in the room. "You'll be surprised how many beginners forget little things like that, and these little things make a big difference," says Rankin. Smith actually compares deejay school to medical school. "Just because you have all the surgical equipment doesn't mean you're ready to do surgery," Smith says. Er, playing music isn't quite like a brain operation, correct? "If you have ruined the biggest day in the bride's life, to her, it's like screwing up brain surgery," Smith responds. The instructor says he does not offer a course in bridezilla management. "If I did, I'd be a millionaire," he says. What's the appeal of being a deejay? For one, the occupation can stroke your ego. "To see everyone having a good time, to get a reaction from them, that's the thing I like," says Sean Williams, 29, who lost his postal service job in July and now deejays in the Bay Area (stage name: DJ Padd). "You can control everyone.' You can also pick up the basics in a month or two, and schools aren't ridiculously expensive: Rankin, for example, charges $600 for a month-long class in Chicago. A five-month intensive course at New York's DubSpot goes for $1,695. Not cheap, but perhaps better than a $100,000 graduate school tab for a career that is evaporating. Some people, like Gandy, take these courses for therapeutic, rather than practical, reasons. "It's really nice to have someplace to go to forget about all that other stuff," says Gandy, referring to her layoff and search for another full-time job. Others play tunes for the extra income. Tony Colvin, who lives in Aurora, Colo., lost his job at a Dow Jones pressman last August. "Deejaying was a pipe dream," says Colvin, 44. "But once I got out of Dow Jones, I really wanted to give it a go." He bought $5,000 worth of equipment, and spent another $150 or so on a class. 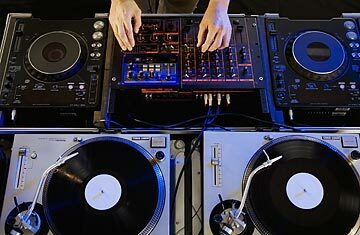 The problem: as more people look to deejaying for extra cash, the oversupply will drive down the number of work opportunities for aspiring MCs, and the fees they can command. "Business is a little slow right now,' says Colvin, who also suffered a neck injury from an auto accident last month, making the job tougher. He has yet to make back his deejay investment. "I'm like a fireman waiting for a call," he says. And though Gandy doesn't envision her career path veering from hedge fund worker to full-time club deejay, she's not writing anything off at this point. "Stranger things have happened," says Gandy, who has also launched a small business strategy firm since being laid off. "I never thought I'd lose my job, and I did. All these people out there are now reinventing themselves. Why not reinvent yourself as a deejay?" See 10 ways your job will change.